Queen Anne’s Lace recalls the simple charm of a photogram, but it is technically multi-layered and complex. The brilliant red background is entirely hand-pulled with the drag-box. Slight overlapping of the bands of color creates pinstripes of darker red. 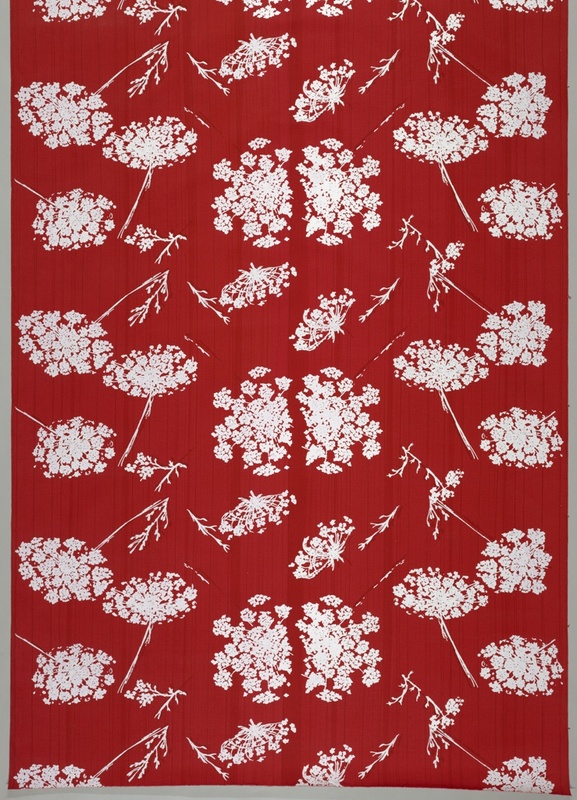 The flowers are screen printed in opaque white ink, while a second screen of just the stems and leaves is printed in red to create a shadow effect. The botanical detail, probably captured by putting specimens directly on the photographic emulsion to create the screens, coupled with the crisp red and white color scheme, give this design graphic punch.